An element's properties are defined by the number of protons that it has, which also has the same number of electrons. Therefore, since if an atom loses/gains neutrons it becomes an isotope, which doesn't change its properties. Therefore, my questions are: Does the proton have particles within it, sort of like DNA, that define the properties of an element? Do these particles, if they exist, have a relationship with the electron? This is an awesome question that hits upon many fundamental concepts about materials science and solid-state physics. You are indeed correct in saying that in general a pure element has equal number of protons and electrons. An important thing to note is that between isotopes, material properties do in fact change, but probably not the ones that immediately come to mind. I'll try to answer your questions in chunks, because this is indeed a huge area of active research that involves many disciplines! Does the proton have particles within it, sort of like DNA, that define the properties of an element? Your analogy of a proton having some of sort of DNA is great. A proton turns out is indeed composed of even smaller particles, known as quarks. Particle physicists seemed to have had a lot of fun naming quarks, as they have peculiar names like up, down, charm, or strange. A proton has been found to be made of two up quarks and one down quark. 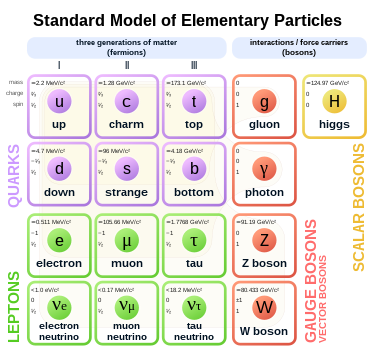 Here is a nice chart that summarizes the Standard Model. Do these particles, if they exist, have a relationship with the electron? From my understanding, there are two major types of subatomic particles- fermions and bosons. The difference between the two is that fermions have half-integer spin and bosons have integer spin. What does that mean? The concept of spin is enough for another answer, but you can think of it as an intrinsic property of the particles, much like its mass or charge. Basically this difference in spin means fermions and bosons are subject to different kinds of interactions when interacting with other particles, and this has extremely important consequences for properties. It turns out both protons (and neutrons) and electrons are composed of fermions. Protons are composites of quarks and electrons are leptons. And these both fit into the larger picture of the Standard Model. One major difference between the two is that leptons do not experience the strong force, i.e., the force that keeps the nucleus together. You might ask, why is universe composed of such particles? Why fermions and bosons? We don't know the reason, only that experiments have shown that the Standard Model is a pretty good start to understanding. There are several ideas for why the universe is made the way it is, the most famous being string theory . In general, it's not required that the number of electrons and protons are the same for a particular atom. What is important is that the system overall is charge neutral, or at least compensated by charge elsewhere. For example, in table salt NaCl (sodium chloride), you have Na+ and Cl- ions and they are arranged in such a way that the substance overall is charge neutral. It just turns out that for a pure element, this is generally thought of as equal number of protons and electrons for a particular atom. By loosening this constraint, lots of different materials are possible (e.g., alloys, compounds, solutions, polymers). This leads us into the idea of how materials properties (e.g., hardness, conductivity, magnetism) arise from level of atoms. Solid-state physics is an entire field dedicated to this, and is what I'm researching in now! Electrons are responsible for a huge array of material properties- electrical conductivity (and conversely resistivity), elastic modulus (how stiff something is), magnetism, optical properties such as reflectance- and chemical properties- corrosiveness, reactivity, acidity, chemical stability. But material properties can also differ between isotopes. Because the mass of the atom has significantly changed, this can affect the thermal conductivity. Most notably, the radioactive lifetime of an element, such as in carbon, is useful for figuring out how old artifacts are! Protons do contain particles that determine what they are. This is pretty different from DNA though, these particles are called quarks, and make up protons and neutrons. All protons are identical: they contain 2 "up" quarks and one "down" quark. All neutrons are also identical, they contain 2 down quarks and one up quark. These quarks determine if a particle is a proton or a neutron. The number of protons and neutrons then determine the properties of an element. Neutrons do actually affect the element properties, just not for bonding. Instead, they affect if an element is stable. Protons and neutrons are made of smaller “particles” called quarks. However, all protons are identical to each other, regardless of which element they are a part of. So, every proton is made of the same combination of 3 quarks. For instance, if you took a proton from helium and put it into uranium there would in theory be no change in the properties of the elements. Elements are solely defined by the number of protons that they contain. The number of electrons in an element can change though which leads to ions which have an electric charge. The gain or loss of neutrons to become an isotope usually doesn’t change the chemical properties of an element, but does change the mass of an element. This change in mass means that heavier isotopes will undergo chemical reactions more slowly. Some isotopes are also unstable and radioactive which means that they can decay into other elements. Electrons are not thought to be made up of any smaller particles and are therefore “elementary.” So protons are made up of quarks, but electrons aren’t. What you say is incorrect: different isotopes have different properties, but those differences are more subtle than the differences between two elements. For example, "heavy water" (with deuterium instead of ordinary hydrogen) has a higher boiling point than ordinary water, because of the different isotope of the hydrogen. The properties of an atom are determined by the distribution of electric charge. Protons have a positive electric charge, and electrons have a negative electric charge, making any non-ionized atom neutral. However, electrons are also grouped into what are called electron shells, which determine how the electrons of one atom interact with to the electrons of other atoms to form molecules, compounds, etc. Protons (and neutrons, also) are composed of smaller particles, called quarks, but aside from having different electric charges (which is why protons have charge and neutrons don't), the quarks in the protons and neutrons have nothing to do with the properties of the atom that they make up. The answer is yes and no. Protons are made up of smaller particles. We know this because when two protons collide they sometimes break apart into smaller pieces. However, this turns out to not have much of anything to do with the ordinary properties of atoms. It turns out that the reason copper is shiny, hydrogen is explosive, mercury is a liquid, and on and on... is just that one number you mentioned, the number of protons and electrons in the atom. click here ). On the other hand, the atoms on the last column (helium, neon, ...) don't have any weakly bound electrons so they are very stable and almost never bond with other elements. There is an exception to what I said above about the particles that make up protons not mattering. When the number of protons gets to be pretty big (say for uranium) the protons start to interact with each other and sometimes this can cause the whole nucleus to break apart. Since these interactions take place in the nucleus so they're called nuclear reactions and (as you probably know) they can release a huge amount of energy.